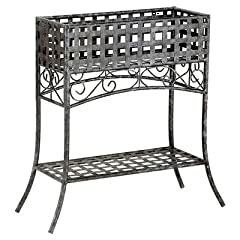 Check out this selection of wrought iron plant stands for the best display ever. 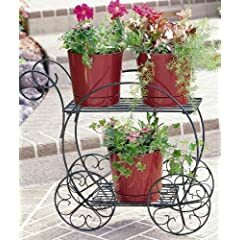 A variety of traditional and unique plant stands, risers, hanging planters for both outdoor or indoor use. I have a bicycle draped with flower pots in my yard and everybody, I mean everybody, comments on it when drop by my home. 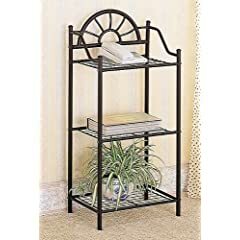 With a solid construction, assorted sizes and shapes the plant stands on this page you are sure to find one for your home. Made of wrought iron, they all offer plenty of space that plant lovers will appreciate and you will be able to admire the display of plants with ease. 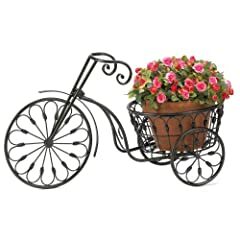 The bicycle and cart wrought iron plant stands present your flower displays in a unique and interesting way in your yard. As mentioned above I personally have one and everyone who visits makes a comments on this unique plant stand even if they are not a cyclist. If find that flowers that drape of the sides give this type of planter the best look. All these stands are built of a sturdy construction to withstand whatever weather conditions that can arise. 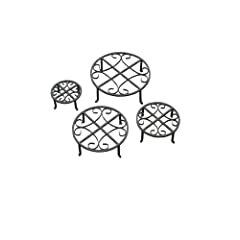 I have mine placed on the lawn and the grass does grow under it so every so often it needs to be moved for trimming, but this style works well on a patio as well while some styles are more suitable for indoors. Click the links below and get one of these decorative styles for your own yard and wow the neighbors.